I’m excited to finally see iPad apps come out that take full advantage of the device’s size and functionality relative to the smaller iPhone/iTouch. Can you imagine plugging your iPad into your 5D MK II, RED, Genesis, or Alexa and doing this someday? It would be wild! But we will probably have to wait a little while for such things. For now let’s take the first babystep in that direction. 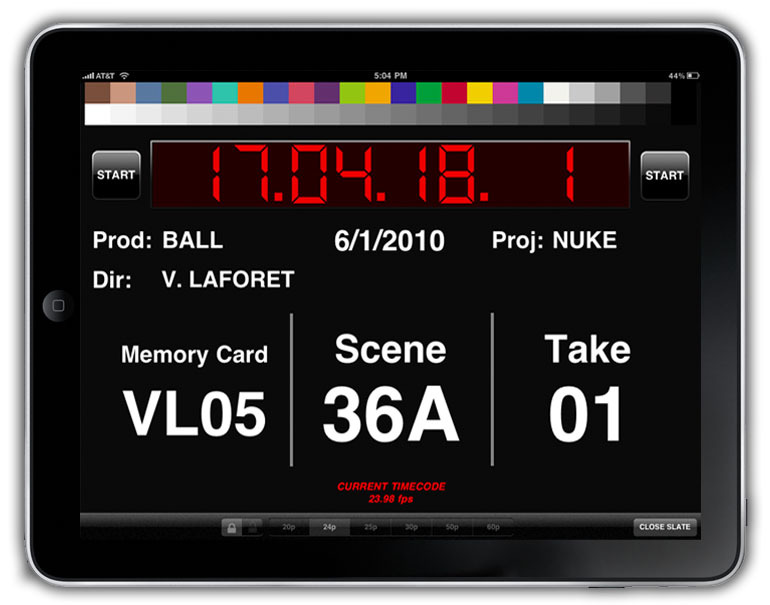 The DSLR Slate App (by Chris Bayol) is a digital slate specifically designed for use with HDDSLR productions and works with iPads and the iPhone/iTouch. 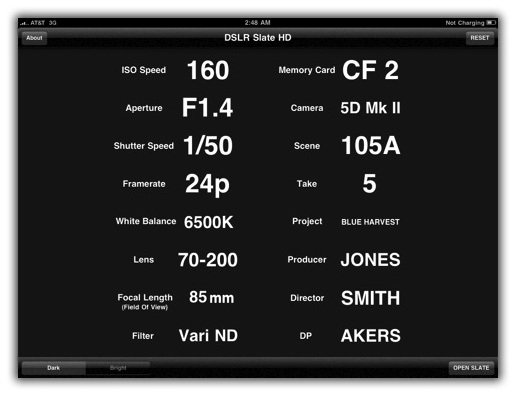 The app operates as a traditional slate, providing you with all the standard information (see picture above), but it also goes a step further and provides information tailored to HDDSLR production, allowing you to log shutter speed, ISO, aperture, lens, and many other details (which can come in handy while shooting tests). All of this additional information is stored by the app, and then displayed for the camera in quick bursts so that each page of information is captured for only a few frames. 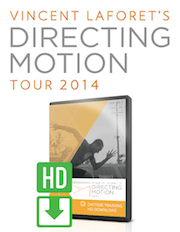 This makes slating on set efficient, and ensures that you have all the information you need in post-production. This app is already quite useful, but I’ve spoken to the developer and there are already plenty of future tweaks in the works. Personally, I’d love to see the app give us the ability to put in production notes, to auto-increment takes as you go, and of course to find a way to jam sync the iPad to your audio recording device – right now I still use my DENECKE, which is a fantastic but expensive proposition. 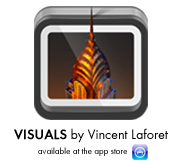 If you are interested in this app, check it out at the iTunes store by CLICKING HERE. I’m not sure whether it’s possible in Aperture, but in Lightroom, one could use the second-monitor support to fill the iPad’s display with the current image, and combined with tethering, could start to fill in as the wireless reference monitor you suggest. @Jeffrey Friedl, here’s something else I just ran across, a guy used an iPad to control his camera with the WFT-4e II and some other shenanigans to get shots of the space shuttle from the comfort of his hotel. 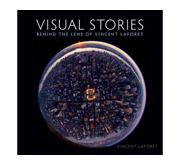 Looks interesting as a concept – but I’m curious how effective it is vs. a traditional slate [not a Denecke smartslate] and pantone color chart – since this doesn’t have the clapping functionality for syncing sound. There is a video flash and an audio beep. Not as sharp as a clap of course, but doable. I really like the app, but before I go and buy it, could you tell me if I could use the color chart that comes with, instead of say, the x-Rite Colorchecker? 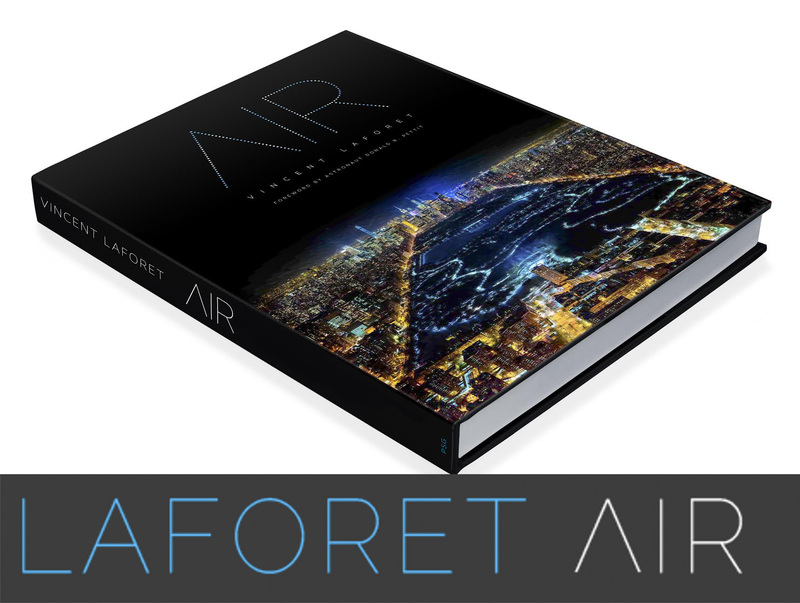 Will I be able to color correct photos in Lightroom simply by shooting one with the color chart of DSLR Slate as I would with the X-Rite Colorchecker? This is a good subject to talk about. Sometimes I fav stuff like this on Redit. This article probably won’t do well with that crowd. I’ll take a look around your site though and submit something else. I really like this idea. The iPad has hundreds of uses and it’s great when you discover one that you never thought off. It’d be good though if the app made the clacking sound of the traditional slates.